Tarun Bharat Sangh (TBS), an organisation working on rejuvenation of rivers in India, has began documentation of rivers on Wiki, especially to draw attention to and mitigate the crisis of toxic deposits facing more than 40 rivers in India. The work was started by Jal Biradari, TBS’s Maharashtra based group, in Sangli district with the help of the Access to Knowledge (CIS-A2K) team of CIS. 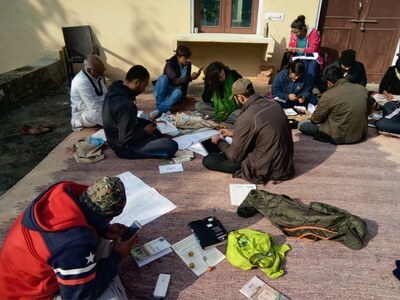 Here is the report from the first pilot workshop conducted by CIS-A2K during 22-25 December 2018 at Tarun Bharat Sangh Ashram, in Alwar, Rajasthan. As per a Government of India report 42 rivers in India are polluted with toxic heavy metal deposits in them. To mitigate this crisis Tarun Bharat Sangh (TBS), an organization working on rejuvenation of rivers in India began documentation of rivers on Wiki. The work was started by TBS’s Maharashtra based group Jal Biradari in Sangli district with the help of the Access to Knowledge team of CIS (CIS-A2K). Realizing the potential of the project TBS decided to integrate this as training module in their capacity building workshops conducted at Bhikampura in Rajasthan. The first pilot workshop was conducted by CIS-A2K during 22-25 December 2018 at Tarun Bharat Sangh Ashram, Bhikampura, Alwar in Rajasthan for 34 participants from eight states of India. Dr. Rajendra Singh, Maulik Sisodiya and Subodh Kulkarni, CIS-A2K were the facilitators. The objectives behind organizing the workshop was to build an open knowledge resource on water related issues in all Indian languages, document the river basins of India, train volunteers working in the sector to work in Wikimedia projects, open street mapping exercises and photo walks along the river and post free content on Commons and Wikisource projects. 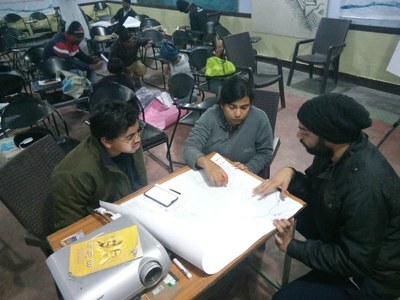 The documentation structure for river basin was decided through participatory process. The participants were divided into 6 groups for working on 6 river basins of Arvari district. The resource material available with TBS in the form of maps, reports, training booklets was used to prepare the schematic maps of each river basin. The water bodies such as ponds, manmade structures like dams were also listed. After this pre-work, the training on Wikipedia editing started. The participants worked in sandboxes first on their articles. The manual of style, giving offline and online references and categorisation were discussed and practiced on sandboxes. The Commons session started with elaborate discussion on copyrights, licenses and encyclopedic content. The images were uploaded on Commons and used in the articles. The articles in the sandboxes were presented by each working group. Taking into consideration various suggestions, appropriate modifications were done. The finished new articles and the additional content into existing articles were then moved in the main namespace of respective language Wikipedia. TBS has decided to re-license 30 books and training material on river in CC-BY-SA. Participants who attended the workshop have started contributing in various languages.